Unlike prior reports, Nokia didn’t break out the total sales for its phone lines. However, the Wall Street Journal tweeted that Nokia sold 8.2 million Lumia devices in the final quarter of 2013, per the company. Nokia didn’t specify the ASP, or average selling price of each handset. By my calculation the total works out to around 30 million Lumia sold in 2013 based on these quarterly numbers for the year: 5.6 million (Q1), 7.4 million (Q2) and 8.8 million last quarter. And it means that in the holiday quarter, Nokia actually sold fewer Lumia devices than the prior quarter. The timing of a phone launch can certainly affect the quarterly sales. Look to Apple(s aapl) and you’ll find that it often sells the most handsets after launching a new model. It doesn’t hurt that the company introduces them during the holiday quarter these days either. Nokia really didn’t have a hero device launch in final three months of 2013 unless you count devices that were new territory for the company. 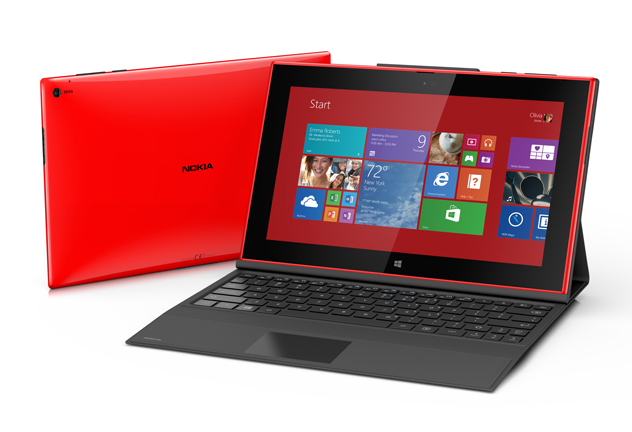 The Lumia 2520 Windows RT tablet and Lumia 1520 “phablet” come to mind here. For Microsoft, it would have been nice to see Nokia phone sales on an upswing at this time. As it stands now, the company has spent $7.2 billion to get Nokia’s hardware business in hopes of further chipping away at iPhone and Android(s aapl) sales. Nokia’s report and comment suggests it will be tough going at the top end and, perhaps worse, even tougher at the bottom end. But hey, that’s what the Nokia Normandy is for, right? The Lumia story had nothing to do with “hero” devices… The ASP was ~ 150 euros for the entire year… They sold practically no hero devices for 2013, among the 30 million overall. You can speculate on many explanations as to how — in a holiday quarter — sales actually fell. It’s really remarkable. But the lack of a hero device is not one of them. Even Nokia gets > 300 euros for the high-end stuff and given that their low-end devices are actually selling for close to the ASP (perhaps 120 euro or so? ), it’s simply not possible that they moved more than 3-5 million high-end phones in the whole year.